Going to the gym can sometimes be difficult, so to make up for those missed days, try exercising in the peace of your own home. The key is being prepared and having the right equipment so you don’t have any excuse to miss a workout. These versatile little gems can be used with almost any workout routine. They don’t take up much room and can last for a long time too. Dumbbells help with strength and resistance training, so be sure to buy them in a variety of weights – heavier weights will help you gain strength and muscle. For those who want to do cardio exercises but cannot afford a treadmill or are unable to go for jogs outside, a skipping rope is a great piece of equipment to have on hand. It can boost your coordination skills as well as giving you a fantastic all-round workout. If you are new to skipping, buy a thicker, more durable rope. For the more experienced, look for a thinner rope to work on your speed or a weighted rope to build strength. These inexpensive exercise accessories can help your flexibility, as well as tone your lower and upper body. They are versatile, and can be used with almost any exercises that you want to modify. They come in a variety of levels, from easily stretched to heavy-duty strength. You can choose from resistance bands with hoops which attach to doors or wall hooks, to those which look like giant rubber bands. Kettlebells add an extra element to your strength training, as they are more challenging than normal dumbbells. Kettlebell workouts combine cardio, strength and flexibility training into one, so are a great investment for those who have to squeeze a workout into a busy schedule. If you are just starting out with a kettlebell, choose one which is half of the weight you would normally choose for dumbbells. 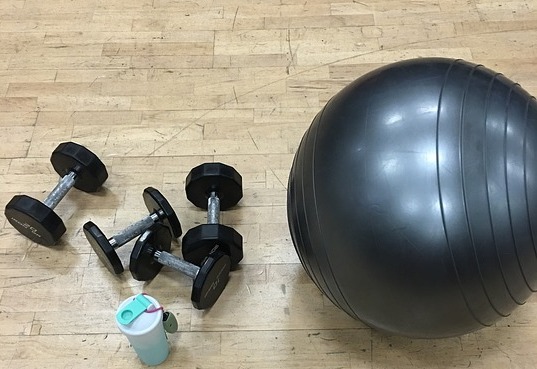 Medicine balls are a great home gym investment. They can be used in core strength movements as well as for adding an extra element to other routines. You should consider the weight of a medicine ball carefully, however, as many exercises involving medicine balls call for speed and power. They also improve your balance and hand-eye coordination.